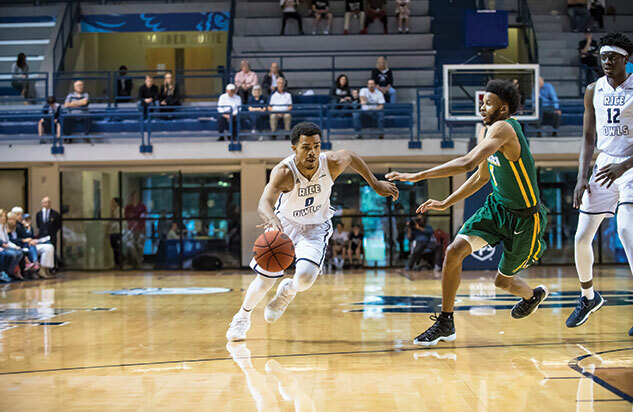 Connor Cashaw ’19 came to Rice from the same Illinois high school basketball scene that produced the likes of current NBA players Dwyane Wade, Derrick Rose, Jabari Parker and Jahlil Okafor. His high school team competed in three straight title games. “In the state championship game, Jabari Parker was guarding me,” he said. “I was like 15, and he was 18 — a future NBA star. It was real.” After averaging eight points per game as a sophomore at Rice, Cashaw nearly doubled his average points per game while leading the team in scoring, rebounding and steals, as of press time. He played an integral role in the team’s response to Hurricane Harvey, volunteering at the George R. Brown Convention Center and helping his teammates raise over $193,000 in relief funds. Breakfast with the team in Tudor Fieldhouse. Last season, this meant fried hash browns, biscuits and sausage. This season, it’s a healthier approach. Goodbye, hash browns. Coach Pera gathers the team together for the scouting report and keys to winning. Starting lineups are introduced. Many creative handshakes are exchanged.